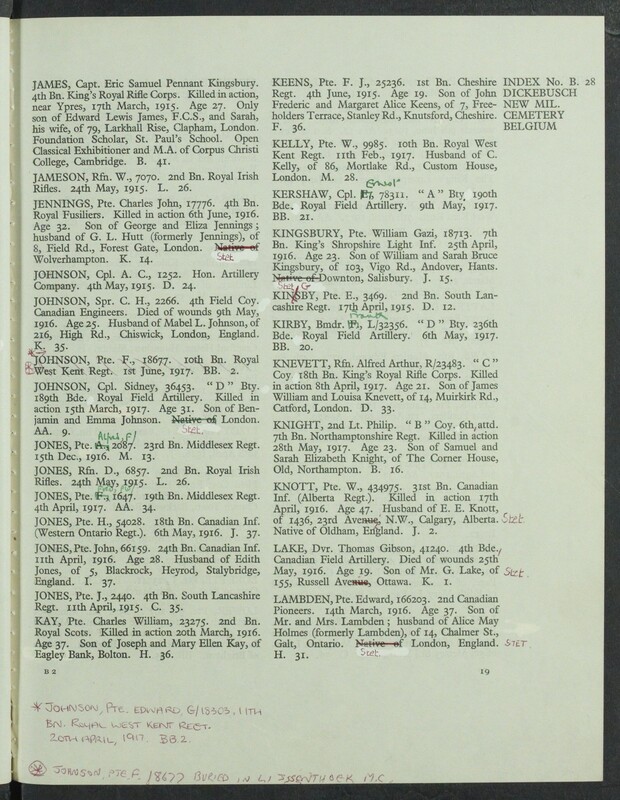 Summary of Service for Private Summary of Service for Private Harry Jones reg. no. 54028 18th Battalion CEF. October 26, 1914 Enlisted Enlisted with the 18th Battalion, C.E.F. on this date in Guelph, Ontario. He listed his next-of-kin as Mrs. H. Jones[ii] who resided at 27 Cork Street, Guelph, Ontario. He did not annotate the relationship of this person on his attestation papers but he indicates he is married so this is his wife. His occupation was as a fireman and he indicated he had prior military experience with the “7 Batty Royal Fusiliers” having served with them for 6 years. His apparent age was 29 years, 11 months and he stood 5’ 3.75” tall with a chest of 36” and an expansion of 3”. He had distinguishing marks. A mole on the right eye. A scar on his chin. A tattoo of an anchor, heart right fore arm. Five vaccination marks left arm and one large vaccination mark on his right arm. He enlisted as an original member of the 18th Battalion as his regimental number and date of enlistment indicates. 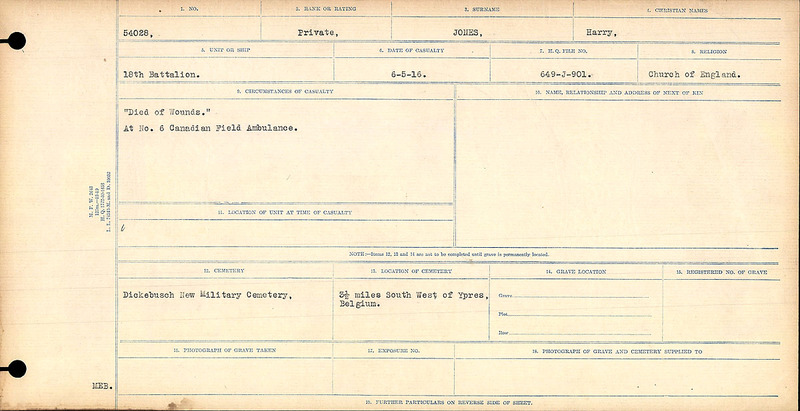 October 1914 to April 1915 Trains in London, Ontario His service record card for this time is “clean”. No indication of any charges or other incidents. The Battalion trained at Wolseley Barracks. December 1914 Separation Allowance[iii] Separation allowance of $20.00 assigned to Mrs. Nellie Jones of 37 Fleet Street, Guelph, Ontario. Unknown Anti-Typhoid Inoculation and Vaccination Record The record of these procedures is missing. They are usually in the service file. April 1915 Assigns Pay[iv] Assigns pay of $20.00 per month to Mrs. R. Jones (wife) residing at 37 Fleet Street, Guelph, Ontario. April 18, 1915 Embarks to England Sails with the Battalion aboard the S.S. Grampian. May 18, 1915 Records Will[vi] “In the event of my death, I give the whole of my property and effects and money due and to become due me from the Paymaster to my wife. September 15, 1915 Embarks for France The entire Battalion embarked to France as part of the movement of the 2nd Division (also known as the 2nd Contingent). 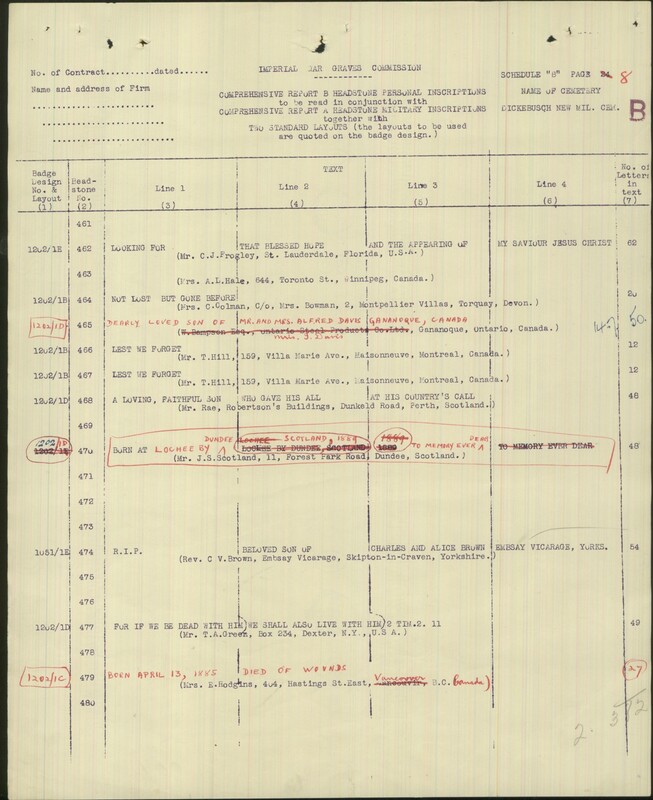 The Battalion moved from West Sandling to France and these movements are related in the War Diary for that month. 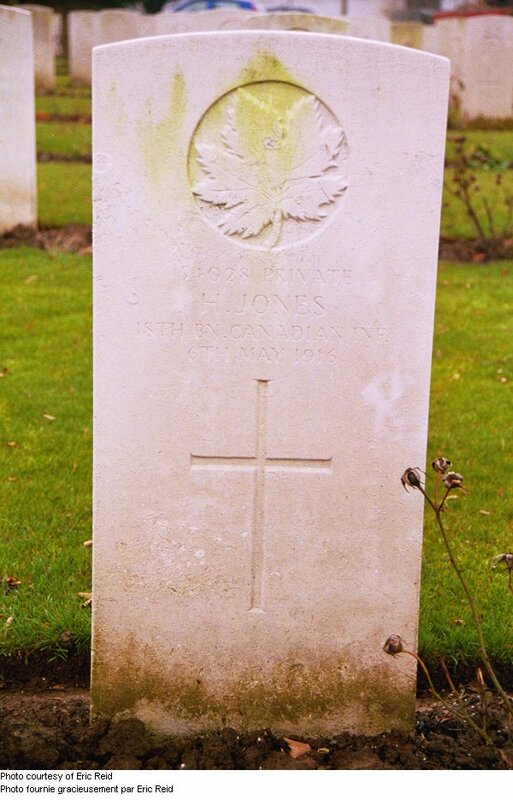 May 6, 1916 Died of Wounds Private Jones dies of wounds at No. 6 Field Ambulance. The exact circumstances of the cause and nature of his wound(s) are not reflected in his service records. The Circumstances of Death Cards of the C.E.F. sometimes contain this information but his card simply states: “Died of Wounds.” at No. 6 Canadian Field Ambulance. At that time the Battalion was engaged the Ypres Sector. The Battalion was billeted at “D Camp” and was off the front-line. The Battalion had been relieved from their last assignment in the front-line on April 27, 1916 at 3:30 a.m. 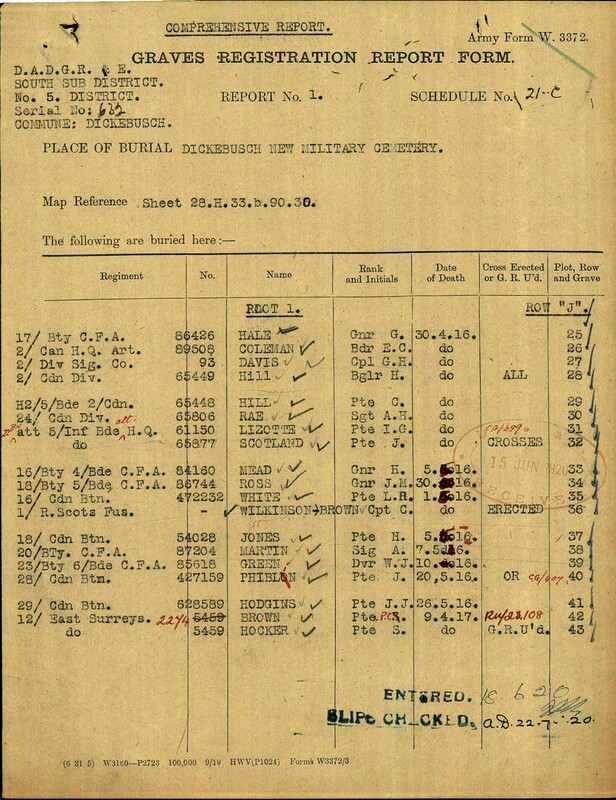 There is no record in the War Diary of any soldiers, other rank or officer, dying of wounds. The Battalion had several “fatigue parties made up of between 300 and 500 men out between April 28 and May 5 so one has to surmise that Private Jones was wounded prior to this date. If this the case, he was severely wounded. A wounded soldier went from the place of discovery by the stretcher bearers to the Regimental Aid Post (battalion level aid) then to the Field Ambulance Post. There initial intervention treatment occurred (i.e. stabilized for further transport or treatment of light wounds) and then the wounded soldier was transported to the Casualty Clearing Station where further treatment was done or they were monitored in preparation for transport to a hospital. If a soldier could not be stabilized or was too severely wounded to move (i.e. transport would hasten his death) the soldier would be made a comfortable as possible to alleviate his suffering. As it cannot be determined specifically the date of his wounding a search of the Battalions Daily Orders of that time would determine the date of his wounding, but not necessarily the circumstances. The Battalion Daily Orders are available in paper form at the Library and Archives and have not been digitized. May 7, 1916 Pension Granted In recognition of service a pension of $20.00 per month was granted to Private Jones’ wife which was paid until May 1917. July 13, 1920 Last Pay Certificate Last Pay Certificate completed. This pay was forwarded to care of William McNab, Doward’s House of Refuge, Montrose, Forfarshire, Scotland on behalf of “Jones’ three orphaned children.” McNab was the guardian to these children. The amount was $100.00 CDN. Augusts 11, 1922 Medal Card The medal card indicates that the medal, memorial scroll and plaque (Death Penny) were to be forward to Henry Alex Jones currently resident at Doward’s House of Refuge, Montrose, Forfarshire, Scotland. There is a note on the card: NB Widow died subsequently. [i] Many C.E.F. attestation papers listed “London, England” as a place of birth. There are many parts of Greater London but often Banardo Home Children would list this generic term as their place of birth. It also could have been laziness on the part of the person filling out the form. In some cases the form as completed in the hand of the recruit and in other it was filled out by a recruiting officer. 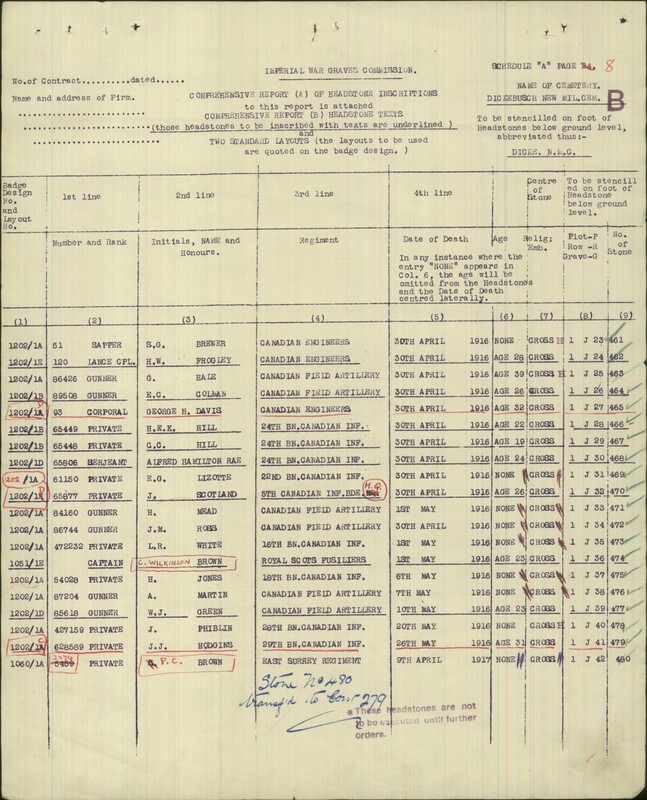 [ii] His wife’s address changes several times in the service record. As these address changes do not have a date attached to them it cannot be determined the sequence of the address changes. The addresses are: a.) 27 Cork Street, Guelph, Ontario; b.) 37 Fleet Street, Guelph, Ontario (not found); c.) 22 Orange Lane, Montrose, Forfarshire, Scotland. [iii] Separation Allowance was granted to married men with children as a form of income supplement. The allowance would end on the death or discharge of the soldier. [iv] Assigning pay was a common practice. Most Canadian soldiers assigned pay of between $15 to $20 per month to their mothers, wives, or other relatives. A private earned $1.00 per day in Canada and $1.10 with allowances when overseas. Other forms of income assistance were created for the families of soldiers who had children. [v] Being Absent Without Leave was a common charge in the Battalion. With about 50% of the members being from the British Isles the temptation to skip camp and go meet friends, relatives or enjoy a local haunt was a temptation many men of the 18th “succumbed” to. The Battalion took these absences in stride and does not seem to overtly discourage this practice other than docking the pay of the subject soldier the appropriate rate for the offence. [vi] The presence of a service will in a service record is common but not insured. It was a requirement to have a will on file as a member of the CEF and many soldiers would write their wills before they went on service overseas. The next most common time was before they embarked for the Continent for active service. The wills were generally of a standard format. This will is not representative of that format. “Died of Wounds.” at No. 6 Canadian Field Ambulance.